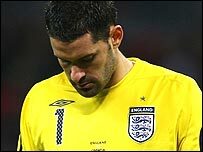 England went 2-0 down when Scott Carson, in for Paul Robinson, fumbled Nico Kranjcar's shot into the net and then Ivica Olic slipped in a second. Frank Lampard pulled one back from the spot after Jermain Defoe was fouled, before David Beckham, winning a 99th cap, set up Peter Crouch to level it. But Mladen Petric fired in from 25 yards to break England's hearts. The result will surely cost Steve McClaren his job as England manager and after such an abysmal display, he can have few complaints. He gambled his position and England's participation on two huge selections and dropping Robinson and Beckham proved catastrophic. Carson's performance will live long in the memory for all the wrong reasons and it may take the 22-year-old some time to recover. When he stepped out on to the turf to warm-up and saw heavy rain making the pitch increasingly treacherous, he could have been forgiven for wishing Robinson - who was not even on the bench - had not been so unceremoniously dumped. With eight minutes gone, he must have wanted part of the rain-sodden pitch to open up and swallow him whole. Kranjcar found space 30 yards out and let fly with a dipping right-foot shot that bounced just in front of the keeper and Carson could only parry the ball into the roof of the net. The stadium fell silent - and six minutes later, England's world was on the brink of collapse. Eduardo drove at the heart of the England defence and played a cute pass into the area for Olic, the Hamburg striker coolly dribbling round a shell-shocked Carson and rolling into an empty net. England embarrassingly appealed for offside, but Wayne Bridge and, ludicrously, Shaun Wright-Phillips - who should not have been that far back - were both clearly playing him on. McClaren's 4-3-3 formation at the start had turned into a 4-5-1 as Crouch was left painfully isolated in attack and his flick-ons were easily dealt with by the Croatians. The visitors could have been more than 2-0 up by the interval - Carson patting the ball down after a shot from Luka Modric only for the ball to luckily skid away, forcing Kranjcar too wide to shoot. Booed and jeered off the pitch, McClaren had to act and he brought on Defoe and Beckham, with Gareth Barry and Wright-Phillips making way. It barely made any difference, before England were handed a lifeline in the shape of a penalty by the eagle-eyed assistant referee, who spotted Josip Simunic tugging back Defoe. The quiet Lampard, with almost his first kick of the game, clinically dispatched the spot-kick to breathe new life into England's campaign. England seemed keen to gift Croatia another goal as first Bridge cleared on to the top of his own crossbar and then Carson repaired some of the damage by brilliantly saving Olic's point-blank header. If the script had been written for Beckham to save his country once again, the former captain seemed keen to follow it. The LA Galaxy midfielder sent over an inch-perfect cross from the right that Crouch expertly chested down and smashed into the bottom corner from seven yards. Wembley erupted, but there was more drama to come on a remarkable night at the new stadium. Croatia sent on Petric and with 13 minutes left, he arrowed a fizzing left-foot shot into the corner of Carson's net from 25 yards. It was what Croatia deserved for a display full of enterprise and heart - and what England deserved for one of their most inept displays in living memory. The result, coupled with Russia's slender 1-0 win over Andorra, means England will not be going to next summer's tournament in Austria and Switzerland. England: Carson, Richards, Campbell, Lescott, Bridge, Wright-Phillips (Beckham 46), Gerrard, Barry (Defoe 46), Lampard, Joe Cole (Bent 80), Crouch. Goals: Lampard 56 pen, Crouch 65. Croatia: Pletikosa, Corluka, Simic, Robert Kovac, Simunic, Srna, Modric, Nico Kovac, Kranjcar (Pranjic 75), Olic (Rakitic 84), Eduardo (Petric 69). Subs Not Used: Runje, Babic, Knezevic, Leko. Goals: Kranjcar 8, Olic 14, Petric 77.